Richard Proteau has worked in the financial industry all of his professional life. After earning different financial industry designations such as FLMI, CLU, RHU, and CFP, Richard wrote many articles regarding fiscal laws pertaining to investments and life insurance. His last professional position was as Vice President of sales in the province of Quebec for a large insurance company. He has been a speaker at many industry conferences. He is currently involved in the financial industry as an advocate for the consumer rights of investors and insurance policy holders. Richard is currently lobbying for changes to regulations to make disclosure of guarantees mandatory for segregated funds when they are replaced by another investment. This is to ensure that segregated fund policyholders are not deprived of billions of dollars in the form of guarantees that would be taken in as profits by insurance companies if the funds are cancelled. Richard is also working on submitting a report on the commercial practices of insurance companies. The first important conclusion of this report is that insurance companies have monopolized the influence over the decisional process regarding the changes needed to modernize regulations in this industry. The consumer is not represented. In fact, the power of the insurance lobby is so great that it has prevented any meaningful changes in this industry for the last 40 years with the objective of limiting the sophistication of the consumer’s response in relation to toxic financial products these companies have sold. Insurance companies have also been able to operate outside of the law using the contradictions found in the different provincial regulations . The solution is to have one financial regulator and one set of financial laws. In reviewing the commercial practices in the financial industry, Richard Proteau will be publishing a full report in 2014 on these commercial practices. This is why he has guarded and protected his independence. Richard Proteau is also a writer. 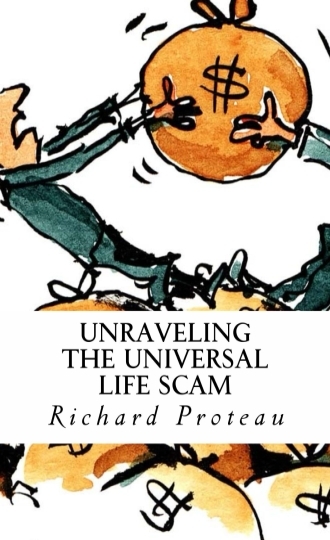 Having been published in various magazines such as Marketing Options, he just recently published a book on the insurance industry titled “UNRAVELING THE UNIVERSAL LIFE SCAM”. Richard, back in 1995 I founded a federal non-profit called the Policyholders Association of Canada to assist policyholders obtain viatical loans and also assist them with the “vanishing premiums” class actions. This non-profit is currently dormant and you may want to try and revive it. My former employer (I had left my money there) moved the defined contribution pension plan from Great West Life to Sunlife in the past year. Sunlife, without direction from me put my funds into what I would call in today’s times a volatile bond fund resulting in a $14,000.00 loss of principal in a 3 month period. They also charged me a $1,400.00 management fee which I had never paid at GWL, although I am sure there were some embedded fees. They relied on the fact that they had sent me a Canada Post letter (I do not recall getting this letter) stating if they did not hear back this is what they would do. I first contacted the group benefit area for Sun Life and then their ombudsman but their response was we sent you a letter and did not hear from you so too bad so sad. I have removed the funds from Sun Life. I have just recently sent this to FSCO and am waiting for their response. Richard, I too am an advocate of life settlements, despite the hollow arguments against an active market in this field. Are you still located in PQ? I’d like to speak with you this week or next if at all possible before going to the LISA conference in Chicago (link below)..